Today’s blog page is about racing teams. Winning riders get the lion’s share of the attention and publicity, but nearly every successful racer has a support team. I’m featuring seven successful rider/tuner combinations from the early days of AMA Superbikes. Some serious early Superbike talent at Louden 1978. Rider/bike/tuner are Reg Pridmore/Kawasaki/DesRoches, Mike Baldwin/Moto Guzzi/Leoni, Paul Ritter/Ducati/Newton, Eric Buell/Ducati/Buell, Ron Pierce/Suzuki/Yoshimura. Most fans of Superbikes know that Reg Pridmore was the first class champion, racing a BMW R90S in 1976. Butler and Smith (the BMW importer) abruptly abandoned their racing after the 1977 Daytona race week, so most people think the B&S race program was only for 1976 Superbikes. The truth is that the single year of Superbike dominance was the end of a 5-year racing program. In 1971 Butler and Smith funded the German-born ex-NASA engineer Udo Gietl to develop a F750 racer, based on the 75/5 model. The bike was raced by Pridmore and others in the AMA F750 and Class C National races. Limited to 750cc, the four-stroke twin was outclassed by Suzuki and Kawasaki two-strokes. Even wrapping the Gietl-tuned motor in a Rob North chassis for 1974 didn’t improve matters, and the debut that year of the Yamaha TZ750 simply meant that, like all four-strokes, the BMW racers were outclassed. The larger, sportier R90S model was more competitive in the Production classes the AMA experimented with in 1974-1975. There were three classes: up to 350cc, 351cc-750cc, and 751cc and up, called Lightweight, Middleweight, and Open. The R90S was a good fit for the Open Production class. Udo had figured out ways to upgrade the R90S motor but was rather constrained by the strict rules of the production classes. The AMA production rules required that the bikes, both engines and frames, be nearly box-stock. 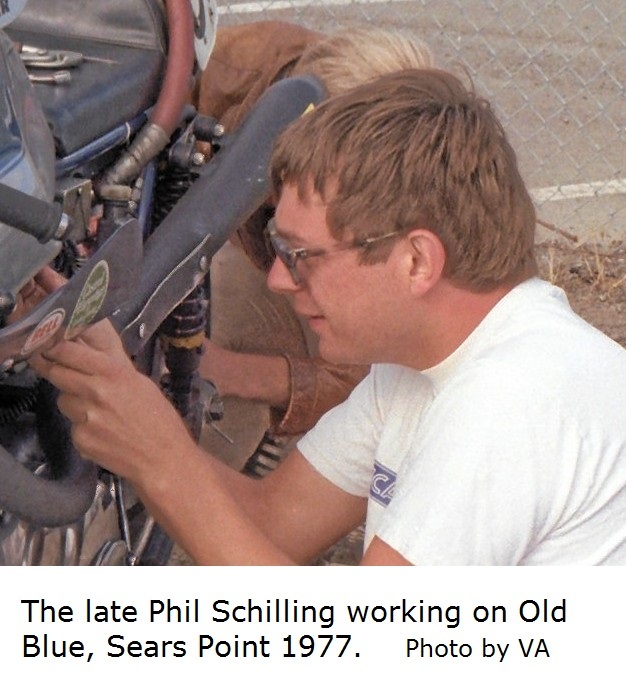 Gietl was an engine man so he called on Todd Schuster to take care of the chassis. Pridmore had some success with the bike in the Open Production class, but when the AMA created the Superbike Class in 1976 the bike really hit its stride. The more lax Superbike rules allowed Gietl to perform extensive changes to the motor. Just one example: he welded closed the intake ports and re-cut them at a different angle to improve airflow. This and other tuning changes resulted in a really strong motor. 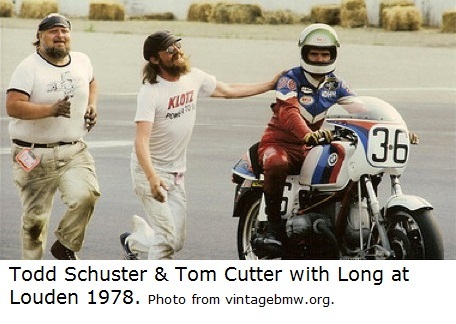 There were four road races on the AMA calendar in 1976 and the BMWs won three of the four Superbike races, the only exception being a second place to the Moto Guzzi of Mike Baldwin at Loudon. Reg was a BMW dealer in Santa Barbara at the time and he knew the motors very well and had a good feeling for just how much racing abuse they could take. He was the only rider of the three rider team to finish all four races, and he was on the podium every time. The successful Pridmore/Gietl/Schuster team earned two wins and two seconds, and Reg took the 1976 Superbike Championship by a wide margin. After Butler and Smith ended their racing program, Pridmore switched to Kawasaki to win two more championships, 1977 and 1978. 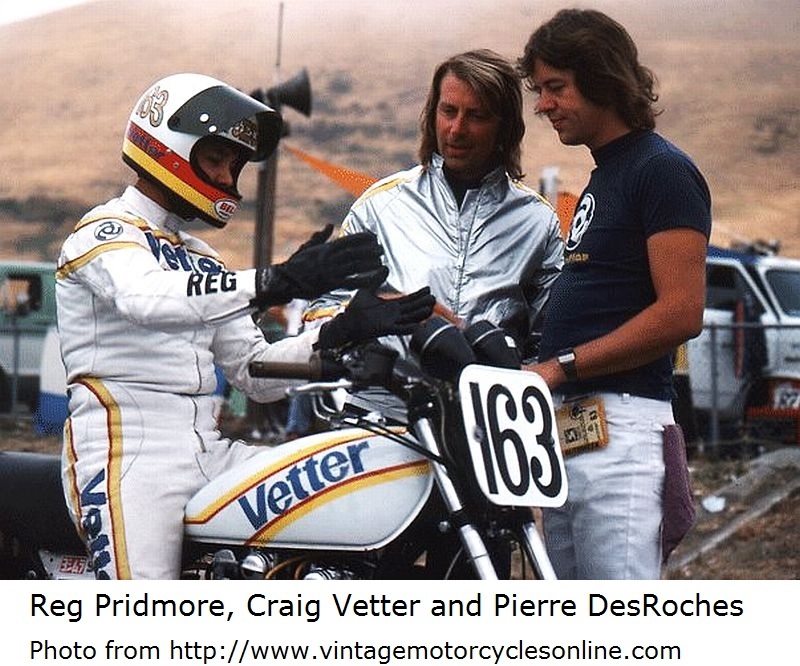 Reg was sponsored by Racecrafters in ’77 and Vetter in ’78, on a Kawasaki KZ1000 tuned by Pierre DesRoches. DesRoches made their KZ1000 as fast as the other big Kawasakis in the field, but with better handling . Even with only one win in the seven Superbike races of 1977, Reg outscored Cook Neilson (Ducati) 71 to 68 to take the championship for the second year running. DesRoches was good and could work under pressure. During practice for the 1977 Pocono, PA, race Pridmore and Wes Cooley tried to occupy the same space in the chicane at the same time. Reg crashed, unhurt, but the Racecrafters Kawasaki did a number of cartwheels and was badly damaged. When the bike was dropped off from the crash truck Pierre and his crew went to work. After a through-the-night flog, the bike was back together by Sunday morning but they missed the heat race so Reg had to start at the back of the grid. It didn’t matter; Pridmore took the lead during the 2nd lap and won running away. He was quoted saying the rebuilt bike was faster than it was before the crash. It was the first Superbike win by a Japanese-built motorcycle. The Pridmore/DesRoches team’s Kawasaki was not as dominant as the BMWs were in 1976, but they were good enough for Reg to win the Superbike championship for two more years. When the more liberal Superbike rules were announced for 1976, they used resources available in Southern California to build a very fast Ducati. They started with a new 750ss model, bored it to 883cc using Venolia pistons with Yamaha rings, had it ported, installed the Ducati-sourced race kit, upgraded the chassis with mag wheels, and reinforced the frame. They called it the California Hot Rod, aka Old Blue. In 1976 it was one of the few bikes that could keep up with the dominant BMWs, but Cook was outmatched by the more experienced riders of the BMW team. 1977 was the year they shined. The pair won the Daytona Superbike Race and scored three second places to lose the championship to Pridmore by only 3 points. If their drive chain hadn’t snapped on the warm-up lap at Pocono the team would have won the championship. But that’s racing. Schilling, like DesRoches, could work under pressure. 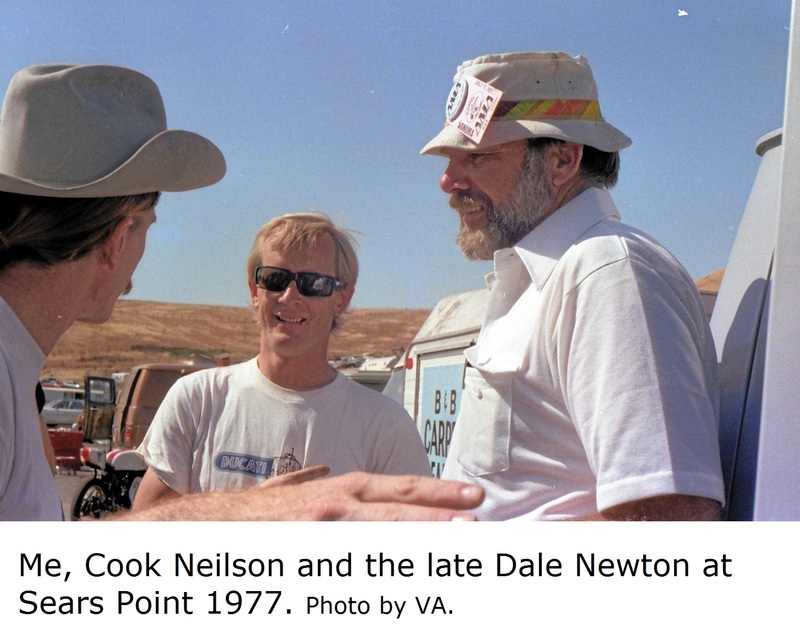 At the 1977 AMA National at Riverside Old Blue’s big-end bearing died during the Saturday afternoon heat race. Phil worked all night to replace the crankshaft and fix the associated damage but had a bike ready for the final. Starting from the back of the grid, Cook moved through the pack quickly and caught up to leader Wes Cooley’s Kawasaki. After battling for several laps Wes took the win by about half a bike length. The pair retired after the 1977 season, but Cook and Phil are still the only team to win an AMA Superbike race at Daytona with a Ducati. In the first few years of Superbike racing the Yoshmura team was the closest to what we think of as a racing team today, with seven or eight members led by Hideo “Pops” Yoshimura and his son Fujio. 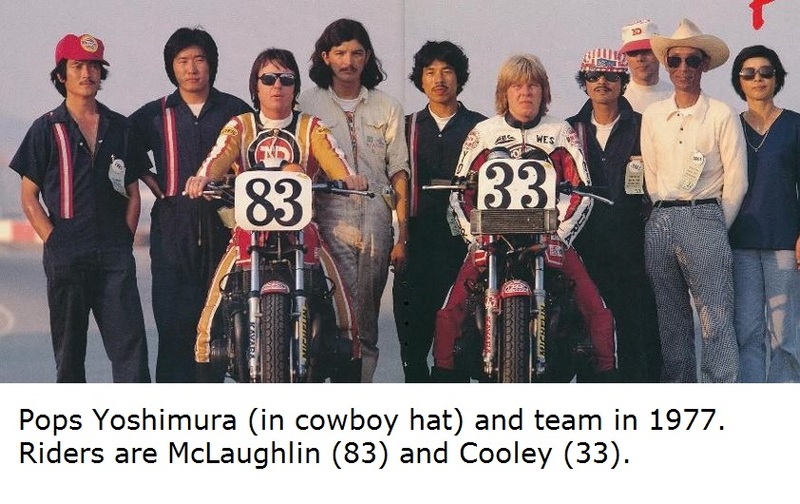 They supported Wes Cooley on a Kawasaki in 1976 and 1977, but switched to Suzuki after 1977. Other top class riders would sometimes be added to the team, notably Steve McLaughlin, Ron Pierce, Dave Emde, and John Bettencourt. Their Kawasaki Z1 was plagued by reliability and handling problems, and Wes recorded only one Superbike win with it, at Riverside in 1977. Mid season the team added a bored-out to 944cc Suzuki GS750 to the stable. The bike won the first AMA National it entered, with rider Steve McLaughlin at Laguna Seca in August 1977. Yoshimura abandoned their Kawasaki effort in 1978, going exclusively with Suzuki. They had some reliably issues in 1978, but once those were sorted out Cooley/Yoshimura won the AMA Superbike championship in 1979 and 1980 on the GS1000 Suzuki. 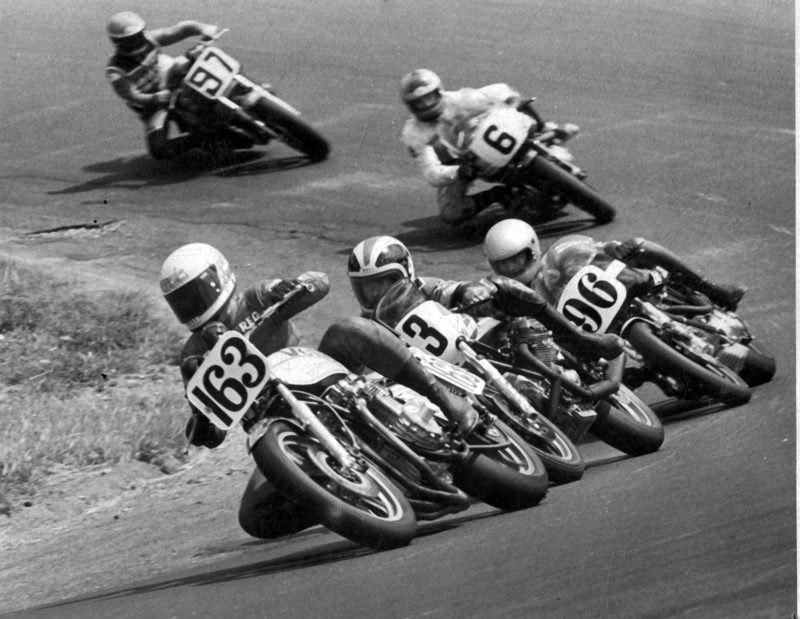 There’s no question that the Yoshimura team was successful in the 1970s. Bear in mind that Cooley won his 1980 championship by beating future world champions Freddie Spencer (Honda) and Eddie Lawson (Kawasaki). The descendant of that Yoshimura team still runs the Suzuki factory effort in U.S. Superbike racing. When Butler and Smith abandoned their BMW racing effort in 1977 the bikes were sold and eventually appeared under new sponsorship. Udo took one of the bikes and eventually found rider John Long to race it. It was a good combination. In 1977 the team didn’t win any Superbike races but they ended up on the podium frequently. John scored enough points to tie Reg Pidmore with 57 points at the top of the list. Pridmore didn’t have a Superbike win either but he had one more second place finish than Long, so he got the Championship for the third year in a row. It could have been a different story. Long finished third at the Loudon race but was docked a lap for an infraction which dropped him to 11th place. Instead of 16 points he got 4. As he explained it to me the bike was hard to get started so they got off on the warm-up lap last. When he got back to the grid John weaved through the already staged riders to his spot near the front. He was moving through the grid after the 1 minute sign was displayed, a serious safety violation resulting in the penalty. Penalty or not, John Long and the Gietl/Schuster team kept that push-rod twin competitive far longer than anyone expected. My hat’s off to them. I’ve got to put Dale and me in this story. We had only a short time together, three Superbike races in 1977 and five in 1978. We scored two wins, one second (with a lap record), a third and two fourths. We had two DNFs, one due to engine failure and one crash. I think that’s a pretty good record. Dale was a perfectionist. His business involved maintaining piston-engined aircraft used to drop fire retardant chemicals on California forest fires. If your engine fails in an aircraft you don’t simply coast to a stop on the side of the road. I stopped racing in 1980 but Dale continued to have success in the Battle of the Twins class, and with the newer Ducati Pantah-based TT2 and TT1 race bikes. Rider Baldwin and Tuner Leoni were responsible for keeping the Moto Guzzi brand in the front lines in the first two years of AMA Superbike racing. I heard that Leoni did something to the Moto Guzzi 850 LeMans’ combustion chambers and it made for wickedly fast bikes that Baldwin raced the hell out of. The only non-BMW win in 1976 was Baldwin on his Guzzi at Loudon. Baldwin and the team’s second rider, Kurt Liebman, had a “can’t catch me” one-two finish at the 1977 Charlotte, NC, Superbike National. The Moto Guzzi proved to be a bit delicate when pushed to the limits and in 1978 Leoni switched to Ducati. In 1979 Baldwin left the Leoni team for Kawasaki and Freddie Spencer rode for Leoni at least once, in Daytona in 1979 I think. Leoni had great success with rider Jimmy Adamo in the 1980s, but that’s another story. Reno Leoni seemed to be a master at getting the best out of the Italian machinery he tuned, and with a good rider he would win races. Sorry no photo — I searched the web for a pic of Leoni and Baldwin but came up blank. That’s it. There are other rider/tuner combinations who won Superbike races in the 1970s, but these seven took the lion’s share of the spoils.